ORLANDO, Fla. — There comes a point during any Orlando vacation when it’s high time to ditch the masses and venture away from the theme parks. When that moment comes, there are plenty of side excursions that welcome a change of pace, whether it’s signing yourself up for a hammock massage or mastering the trapeze. It’s easy to find authentic hideaways brimming with character that allow for a glimpse into another side of Orlando. One that comes with plenty of elbow room and has nothing to do with Mickey Mouse. After the sun sets, the water lights up in the Banana River Lagoon Nature Preserve, about an hour from Orlando. From June to late September, SoBe Surf in Merritt Island guides guests through the glowing waters via kayak or paddle board. The underwater fireworks show is all thanks to single-celled organisms called dinoflagellates that leave a swirl of blue as your paddle cuts through the water. Along the way, it’s not uncommon for manatees to pop up alongside and say hello with a snort. Not to mention, the occasional shooting star, Atlantic bottlenose dolphins (which also light up blue) and the always-entertaining jumping mullet. Spending time in a hammock is always a smart idea. Snagging a massage while you’re at it, well, that’s even better. The Ritz-Carlton Orlando, Grande Lakes offers a 70-minute hammock massage at the rooftop eco garden that will have you smiling and perhaps even snoozing. While the hammock sways back and forth, a therapist loosens up your lucky limbs and gives your feet a rub down. Post-massage, the spa mixologist whips up drinks made with fresh herbs from the garden and the Vitale Spa Cafe has Mighty Green Smoothies and healthy bites on hand. Comfy couch? Check. Adirondack chairs? Check. Coffee table? Check. A private cabana at Wekiva Island certainly has the creature comforts covered. Surrounded by wildlife, a boardwalk and 100-year-old oaks, it’s Old Florida at its best. Nearby, The Tooting Otter wine bar serves up charcuterie boards and craft beer, and Without a Paddle Cafe serves crowd pleasers like beef brisket and gator tacos. No need to move a muscle, though: service to the cabanas is speedy and often. When it’s time to venture out, the Wekiva River is perfect for tubing, paddle boarding, kayaking, canoeing or just taking a dip. The spring-fed water is 72 degrees all year long. And, yes, a gator sighting is nearly guaranteed. A great way to get to know a city is by seeing it on two wheels. That’s why Elite Road Bike Rentals provides a hybrid bike tour through Orlando and Winter Park that shows off the area’s hidden gems. The 20-mile tour begins downtown and takes riders through Loch Haven Park, which is full of outdoor art and “The Mayor,” a massive oak tree, which was around when the Constitution was signed. Instagram worthy, indeed. Next up: the McMansions of Winter Park, complete with lily-pad laden lakes, canals and tree canopies galore. The photo ops continue in Kraft Azalea Park, home to massive cypress trees and humming cicadas. Spurts of the tour run along the Cady Way Trail and the Orlando Urban Trail, both of which provide lots of shade. On the outside, the Dr. Phillips Center for the Performing Arts, which opened in late 2015, is sleek and sophisticated. In the heart of downtown Orlando, the building’s 105-foot cantilevered roof looks like an oversized Southern Florida porch and the wide-open patches of surrounding grass invite you to sit a spell. It’s a multimillion-dollar cultural gathering space that showcases everything from Broadway acts to comedians to dance troupes. Inside: There’s no skimping on design and carefully planned gathering spots. There are 13 bars, a blackbox theater with a colorful ceiling of artwork and a 2,731-seat theater sporting some serious acoustics. A few blocks away, you’ll find gastropubs, cobblestone streets, historic bungalows and the mile-long Lake Eola, home to the farmers market, outdoor yoga sessions and loads of locals. When Andrei Roublev and Irina Roubleva put on their thinking caps, good things happen. The proof? Orlando Circus School. This super fun warehouse is home to a trampoline, aerial arts silks, German wheels, hula hoops and a flying trapeze. As former Cirque du Soleil performers, their grand plan is to teach others amazing feats in the form of tumbling, dancing and juggling. Just to name a few. If you’ve ever wanted to launch yourself in and out of the water dolphin-style, flyboarding is a dream come true. What exactly is this newfangled sport? It’s part hoverboard, part jetpack and 100 percent awesome. Using high-powered water jets, flyboards launch you 30 feet into the air to flip and frolic as you wish. After a quick orientation, Full Throttle Flyboard Co. gets you out on the water with a flyboard strapped to your feet. After that, it’s up to you to unleash your inner super hero. 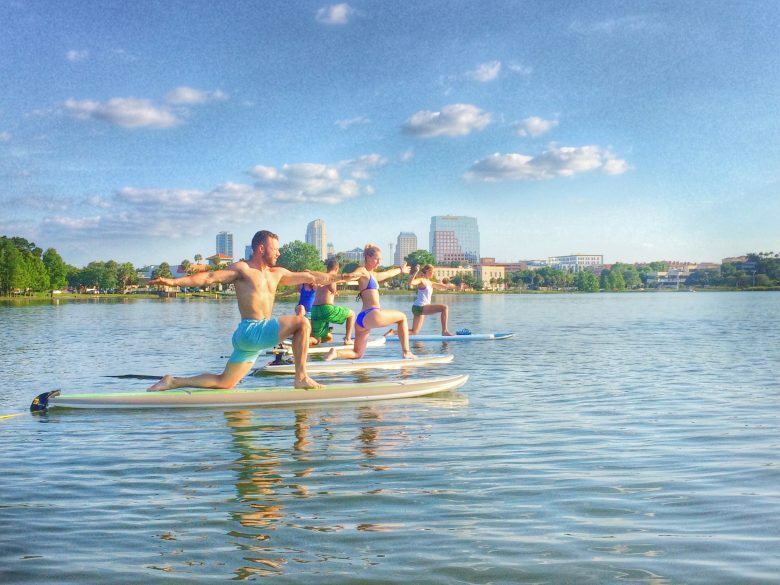 Downward dog, tree pose and sun salutations are even more rewarding when you’re balancing on a paddle board. Morning and sunset classes are held weekly on Lake Ivanhoe and Lake Sybelia where wildlife is abundant.